We're delighted to be able to carry on this tradition and celebrate the rich history that only Gettysburg can offer. 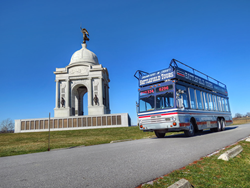 Gettysburg Battlefield Tours is pleased to present its famous and highly anticipated Sunset Double Decker Bus Tour, primed for departure at 6 PM on August 30th. The two hour trip, ideal for families and civil war enthusiasts alike, will make a stop at iconic Little Round Top and include a visit from a special Civil War combat veteran. The tour captures the imagination of its patrons with the help of headsets that broadcast a dramatized audio presentation of the scenes and sounds of one of the most decisive events in US history. Capping off the late summer evening tour, visitors can see a glowing sun setting over the golden, battle tested fields of historic Gettysburg. Perhaps the most novel feature of the Sunset Double Decker Tour, however, is the Double Decker Bus itself. The acclaimed and recognizable two-level bus allows spectators the option of open air or enclosed seating. To complement the Sunset Tour experience, Gettysburg Battlefield Tours welcomes other attractions this season. The brand new Rosa’s Demise tour combines history and haunting as it chronicles the story of the late Rosa Carmichael this August 2nd and November 15th. The Historic Tavern Tour is slated for August 23rd, during Gettysburg’s annual Brew Fest, where visitors will have the unique opportunity to learn about the role that Inns and Taverns played in the war and through the 19th century. Guiding interested battlefield visitors since the 1950’s, Gettysburg Battlefield Tours continues its mission of bringing the battle of Gettysburg to life. Although well versed with licensed battlefield tours, presidential tours and the ever popular ghost tours have been mainstays for years with avid guests looking to explore Gettysburg to its fullest. Whether it’s a chilling visit to the Jennie Wade House or a sightseeing trip down Confederate Avenue, Gettysburg Battlefield Tours can make your next trip to Gettysburg a memorable one.